Have you ever wondered how to make your website irresistible??? Well on today's chat the amazing Bianca + Kyle Thompson - the Duo behind Oak and Iron Photography, give us their views on this amazing and important topic. Did you know that you only have 5 seconds to capture somebody once they land on your site?? Yes, 5 seconds! CRAZY, but it is true! So if your site is not amazing, you are missing out on the opportunity to connect with new clients and that means you just lost money. Listen to today's podcast to get some insight on what makes a website irresistible and tips you can implement right now! Meet Posy! She is a very talented family photographer based out of Portland, Oregon. She has been in business for the past 10 years over which she has learned a thing or two about family photography. Her style is fresh, easy going, and her images are filled with raw emotions! She is also one of the founders of The Family Narrative, a retreat for family photographers. In today's podcast we chat about connecting with your clients plus some other tips that you can implement in your business right away. Posy also gave us an introduction about The Family Narrative and why this retreat is amazing! Hear me out, a confused mind doesn't buy! You want to be a great photographer that has tons of products for your clients and you want to give them many many options to choose from...right? But guess what? While you think this is a fantastic idea, the reality is that you may be overwhelming them with all that information. And guess what? An overwhelmed mind doesn't buy! Also, don't forget to join our Facebook Group! Great content and tons of talented & amazing people over there! So I'm very excited about the Winter Olympics! They're fun and entertaining, but mostly I'm mind blown by the dedication, commitment and resilience of the athletes. That's got me thinking what if we treated our photography business as if it were the Olympic Games?? If that was the case we'd be athletes competing for gold medals and putting our heart and soul to give it all to win! Check out todays podcast to discover how having an Olympian mindset can elevate your business. Listen to today's episode to get an idea of why perseverance and commitment is what brings home the gold! And if you want to read more about this topic you can head over to this blog post that I wrote 2 years ago during the Summer Olympic Games. Meet the amazing Dana Pugh, she's a family, wedding, and commercial photographer based in Calgary, Canada. Her work has won many awards and has even been featured on the big screen in Time's Square. In addition to her fantastic work, Dana is on a mission to help photographers price themselves correctly! Make sure you listen to today's episode so you can get a better idea on how to start making a profit on your photography business. On today's episode I had the chance to chat with the amazing Joshua Kane about being a destination wedding photographer. We talk about how his story translates into travels and how his clients fly him all over the world to photograph their celebrations. Joshua also shares with us his desire to help the photography industry in a way that is not only educational, but embracing the individuality of each photographer with his upcoming workshop Water for horses. Listen to today's episode to get to know Joshua, plus get an inside scoop on what it takes to get your photography business on the road! I know, I know... Just the word "Self- promotion" gives you hives, after all that word has a bit of stigma attached to it. Only people that are self-centered narcissists self-promote, right? People that own a business and understand the power of connections self-promote. After all, if you are not talking about your business, then who is? But let's be clear, self- promotion is an art. The art of flipping the script and instead of taking about how amazing and great you are, you are going to talk about your clients and their stories. Are you confused about this? Don't worry. I break it down on today's podcast. Hello Friend! On today's podcast I chat about the difference between photographers that are charging little money and the ones that are making a good living with their craft. Hint, this has nothing to do with location, experience, or even the quality of their work. Meet Rose + Thomas, founders of BitterSweet Design. As photographers it's crucial that we convey value not only with our images, but also with our brand and marketing materials! On today's chat I got the opportunity to chat with Rose + Thomas about their beautiful work and how useful their products are for photographers. At BitterSweet Design you can find stunning templates that you can use to improve your branding and elevate your client's experience. We are entering the busy season! Not only does our business demand a lot from us, but there are also a lot of holidays coming up soon that require our attention. The next couple of months can be extremely busy and if you don't take care of yourself you could get burned out and nobody can afford that. In today's episode, I chat about the importance of taking care of your mind and body. Self care is even more important that any marketing strategy because without your wellbeing your business will definitely suffer. Photography services are a luxury for most people. And because of that, what others say about your business can make or break your studio; word of mouth is a powerful tool! In today's episode I share with you why testimonials are so important to give credibility and social proof to your business. Listen to get some ideas on how to use testimonials to grow your brand and how to ask your clients for them. Meet Rachel Brenke, the lawyer and founder behind The Law Tog. I found out about her website a couple of months ago when some of her blog posts were shared on a photography group. 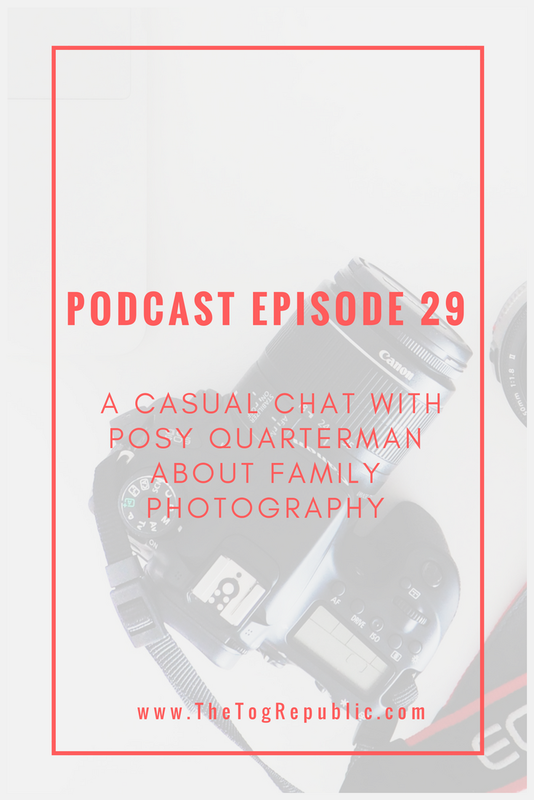 Her blog is filled with informative articles about the many legal aspects involved in having a photography business and if you like listening to podcasts she also has one that is packed with tons of useful information. In addition to all the free content that Rachel shares with her community, she has a shop where you can find contract templates, legal guides, and tax tools. Listen to today's chat where Rachel explains why it is so important to have your business registered and always use a contract! If you are a photographer perhaps you are considering hosting a day for mini sessions, after all everybody else is doing it right? But if you have learned something here at The Tog Republic, is that you should never do things in your business just because everybody else is doing it, but instead you should always take a look at the marketing opportunity and evaluate if it's the right move for your business. That being said, I don't like mini sessions and I have some valid reasons for it. As a matter of fact, I think that if you are not careful mini sessions can actually hurt your business and leave you exhausted. But I do have to admit there are ways to make mini sessions work! And if you plan a smart strategy they can be not only profitable, but put your name ahead of the competition. Listen to today's episodes to find out all about mini sessions, why I don't think they are the best strategy for your business, and how to manage the current system to create a similar experience that is not only profitable but is also on brand! Facebook currently has 2 billion active users and I can guarantee that within that large amount of people using the platform your audience is hanging out there! We all know that organic reach has decreased significantly, but Facebook has giving us the platform to create ads at very low cost and with the ability to target our audience in a very specific level. I had the opportunity to chat with Easton Reynolds, founder of The Art of Six Figures about Facebook ads and how his campaigns have allowed him to reach his ideal brides and book more weddings! I'm not going to sugar coat it and say that advertising in Facebook is easy, but let's be honest it isn't difficult either, and if you want to avoid the learning curve Easton has an amazing class that covers it all! Listen to today's episode to learn about Facebook ads and how they can transform your business. Easton covers some of the basics in this marketing chat and I can't wait to hear about your experience with this marketing strategy. You can learn more about The Art of Six Figures here! There are two kinds of people, the ones that have a clean email, and the ones who have 1000 un-opened emails. What kind of person are you? I'm a type A personality when it comes to email. I like my email to be clean and organized and as a solopreneur it helps me with my admin tasks and to keep my business productive. If you want to learn more about how to prioritize your email, listen to today's podcast. As always you can always join the conversation on our private Facebook group, see you there! Meet Vanessa Velez, she is a destination wedding photographer based in South Florida and the leader of the Tuesday's Together Fort Lauderdale chapter. I met Vanessa about two years ago when I attended my first Tuesday's Together meeting. I was immediately drawn to her warm personality, kindness and willingness to help out the creative community here in South Florida. Being an entrepreneur can be lonely, so finding a group of people that are on the same journey can be not only refreshing, but inspiring! Listen to today's casual marketing chat with Vanessa to learn a bit more about #CommunityOverCompetition and how to find a local group that can help you grow in your creative business. Vanessa also shared with all of us her love for styled shoots and how they can help you group grow not only as artist, but as a community. Take a look at some stunning images from a session she and her group put together in 2016. You can see more of this stunning session on her blog + a list of all the vendors that were a part of it. Let's be honest for a second and admit that getting an email that reads "Your price is too high, you're our of our budget" is a bit awkward and sometimes it even triggers something within us. But every now and then, getting and email like that it's part of doing business. There will always be someone that can afford our services and is not shy about letting us know. Your power relies on the way you reply to those kind of emails, and yes, I do think that as a business owner you should reply to those emails - but in a smart and branded way. Listen to today's episode to get a new perspective on why replying to those emails can be beneficial to your business, and how to do it in the most professional manner! Grab some tea, coffee (or your drink of choice) and enjoy this episode. Also, don't forget to share it with your friends. Meet Chip! He's a fantastic wedding photographer based in Texas and founder of BlogStomp - My favorite tool for blogging! I had the opportunity to chat with him about why I love BlogStomp so much and how thanks to it, I save hours of work every week. Chip also shared with us some other amazing tools StompSoftware offers to help minimize the workflow for photographers! Go ahead and grab some tea, coffee (or your drink of choice) and enjoy this episode. Also, don't forget to share it with your friends.